Web 2.0 is a buz word. At a conference that I attended last week it came up frequently as being one of the most over-hyped terms around at the moment, but there is substance behind it, and how that substance appears is fully up to the creativity of people who are willing to get their hands dirty with the actual data that is being produced by social web sites. I came across this example today and it exemplifies the type of thing that can be done. These researchers are looking at time traces of pictures of locations uploaded to flickr and pulling information about those places out of this data. 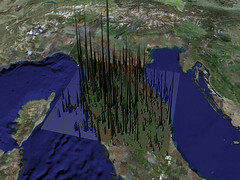 The image here shows activity in and around tuscany. They are also looking at routing through contries and heat-maps of tourist visits to cities.